Toyota Motor Corp. Executive Vice President Mitsuhisa Kato poses with a Toyota new Prius at the Toyota showroom in Tokyo, Japan, Wednesday, Dec. 9. Toyota said Wednesday it expects annual sales of its newly-released fourth generation Prius hybrid to reach as many as 350,000 vehicles despite a big drop in oil prices making traditional gasoline cars cheap to run. The automaker is promising mileage of 40.8 kilometers a liter (96 miles a gallon) in Japan for its latest version of the gasoline-electric car, better than the 40 kpm initially projected. Mileage tests and driving conditions differ by nation. 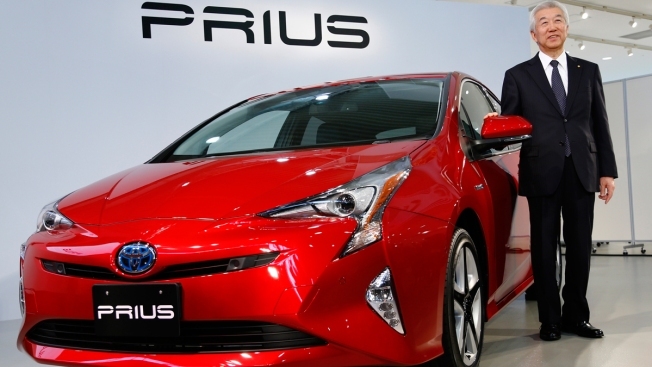 Toyota Motor Corp. has promised about 52 mpg in the U.S.
Executive Vice President Mitsuhisa Kato told reporters at a Tokyo showroom, that the latest Prius made fewer driving experience compromises to achieve better mileage. "There is nothing you feel you are suffering through to get that mileage," he said. Improvements in the battery, engine, wind resistance and weight are contributing to the improved performance, according to Toyota. The new Prius also got a design makeover, although reaction has been divided. Toyota has sold 3.6 million Prius vehicles globally, making it the world's top-selling hybrid, but its popularity is mostly limited to the U.S. and Japan. Toyota faced skepticism when it first introduced Prius in 1997. Sales last year totaled about 240,000 vehicles. "In my mind, there is no doubt that this new model will be well received," said Max Zanan, chief executive of IDDS Group, a New York-based consulting company that specializes in auto retailing. "It will continue to set the pace for, and dominate, the global hybrid car market." A hybrid switches back and forth between a gasoline engine and an electric motor to deliver an efficient ride and reduce emissions. They deliver more of a perk in stop-and-go city driving than freeway driving. Japan sales started Wednesday, and are set for January in North America and February om Europe. Toyota says it's expecting to sell 12,000 Prius cars a month in Japan, with projected annual global sales at 300,000 to 350,000 vehicles. Kato brushed off questions about how the recent drop in oil prices may negatively affect sales. Energy and ecological worries are here to stay, he said. Japan pre-orders total 60,000 vehicles, and many of the buyers will have to wait several months for their Prius to arrive, as production can't keep up. Prices in Japan, also announced Wednesday, are higher than the previous model's, starting at 2.4 million yen ($20,000), up from 2.2 million yen. Overseas prices have not yet been announced.